Recirculating chiller for rotary evaporator KD TRADERS introduces chillers for rotavapor or Rotary Evaporator. We are sourcing the chillers for the purpose to keep chillers cools in the heaters. We are focused design the innovative ideas and design with suitable adjustable mechanical devices.The chillers are the mechanism which is used to remove heat from a liquid via a vapor-compression. we customize Chillers according to the END USER For MULTI ROTAVAPOR USE , A SINGLE CHILLER CAN USE TO MULTIPLE ROTAVAPOR OR ROTARY EVAPORATOR This products are majorly used in the laboratories, scientific research, etc. Brand name KD CHILLERS Indigenous developed high Performance Cooling circulations for Rotary Evaporators have big cooling capacity and are compatible with Senco Rotavapors. recirculating chiller for rotary evaporator chiller for rotary evaporator And we are Chillers Manufacturers, Suppliers & Wholesalers in Hyderabad chiller for rotavapor chiller for rotavapor in hyderabad Multi functional Chiller for Rotavapor and we customized according to end user TECHNICAL SPECIFICATIONS Features KDC05 Medium Temperature Range -5℃~20℃ Temperature Stability ±1°C Cooling Capacity 500Watts @ 0C Pump flow max 8l/min Bath Volume 5L Mobility Heavy duty castor wheels MOC Outer body powder coated Crc & amp; S.S 304 inner Refrigeration CFC Free Emmersion Dimensions (cm) 30x50x53H Supply voltage 230VAC; 50Hz (5A) KD TRADERS introduces chillers for rotavapor or Rotary Evaporator. We are sourcing the chillers for the purpose to keep chillers cools in the heaters. We are focused design the innovative ideas and design with suitable adjustable mechanical devices.The chillers are the mechanism which is used to remove heat from a liquid via a vapor-compression. we customize Chillers according to the END USER For MULTI ROTAVAPOR USE , A SINGLE CHILLER CAN USE TO MULTIPLE ROTAVAPOR OR ROTARY EVAPORATOR This products are majorly used in the laboratories, scientific research, etc. Annual Maintenance Contract: We provide comprehensive Rotavapor or rotary evaporator Maintenance & service . We are capable of meeting stringent SLAs as per customer business needs, cost effectively. Maximum uptime is the Single most Critical requirement for most of the customers and the same is achieved through, Quick resolution of breakdowns and Preventive Maintenance. Availability of spare parts, Technical expertise, proper coordination and support capabilities across wide range of products enables Navigator Services to provide maximum uptime. 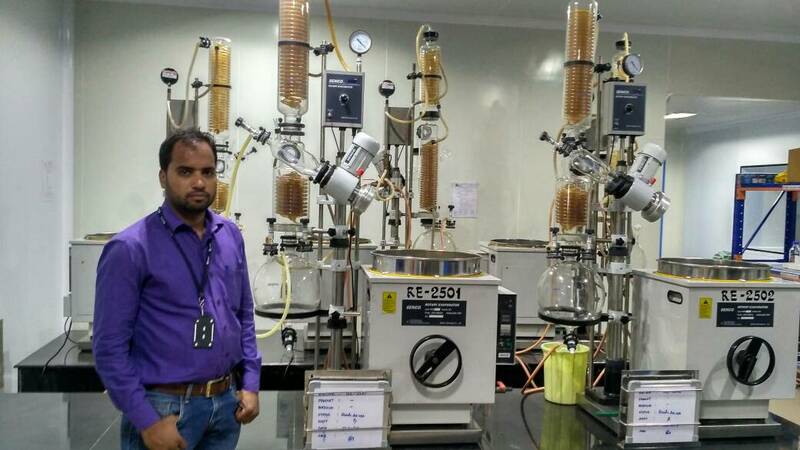 Rotavapor in hyderabad rotary evaporator in hyderabad , Senco rotavapor .